Djokovic Nadal seems to be the new rivalry in men’s Tennis! As of June 2012, Djokovic is number 1 in the world and Nadal is number 2. Djokovic dominated the rivalry in 2011 but Nadal just bounced back with an important win in the 2012 French Open finals! Incredible Rallies In The Wimbledon Finals! As of June 2012, Djokovic and Nadal have played against each other 34 times and Nadal leads the rivalry with a 19-14 record! In 2011 Djokovic won all 6 matches between these two, including two Grand Slam finals and 4 masters series finals; two of which were played on clay! Djokovic won what is considered one of the best Grand Slam finals of all-time at the 2012 Australian Open! One Of The Best Tennis Matches Of All-Time! Since then Nadal has bounced back with 3 straight victories over Djokovic on clay, including the French Open and two masters series finals! Nadal holds a 11-2 edge over Djokovic on clay. On grass Nadal also holds the edge with a 2-1 record, yet Djokovic won the most important match in the Wimbledon 2011 finals. Djokovic leads Nadal 12-5 on hard courts! A Familiar Picture in 2011! 2007 Wimbledon Semifinals:   Nadal wins 3-6 6-1 4-1 ret. As you can see Nadal won all of the important matches before 2011. After that Djokovic won 7 in a row and now Nadal has won 3 consecutive big matches on clay again. Let’s examine this in more detail and look at the match-up between these two players in regards to the four areas of Tennis! Let’s try and figure out what the deciding factors in this rivalry are! To me Djokovic has an edge in the technical match-up. Let’s compare all of the strokes for these two players. This is the only shot where Nadal could possibly have an edge. When Nadal’s forehand is at its best and he hits it really aggressive, I believe it is more dangerous than Djokovic’s forehand. Nadal hits the ball with a lot more topspin than Djokovic, often reaching spin levels of around 5000 rpm! Djokovic on the other hand takes the ball earlier and is better at flattening out the shot, which allows him to hit more outright winners with the forehand. Overall a very close call but I would still give a slight edge to Nadal. Djokovic has the best backhand in the men’s game. He can do pretty much whatever he wants with this shot and has a clear advantage over Nadal in this area. Nadal’s backhand has been up and down throughout his career. Whenever his backhand is relatively weak and lands short too often Nadal is in big trouble against Djokovic! Djokovic has a big edge on the backhand side! Both of these players don’t have great slice backhands. They can use it to defend and stay in rallies but neither one of these guys possesses a dangerous slice backhand. I see this as a tie! Now this is another close call. Djokovic has struggled with his serve in the past but in 2011 he served incredibly well and it appears that his serve has improved a lot. Nadal has also improved his serve over the years but still does not get a whole lot of free points from the serve. Djokovic’s serve seems to be consistent these days and I give him a slight edge in this category! From a technical standpoint Novak definitely hits better volleys than Rafa. Rafa’s backhand volley is shaky with a very open racket face. I give the edge to the Djoker here! Nadal has been considered the fittest player of all time and he intimidates his opponents with his physicality. Novak Djokovic on the other hand has developed into possibly the best mover around the tennis court in 2011. He changed his diet and committed to the physical work off the court. In previous years you could see Novak breathing really hard after long rallies and it seems like that is not happening anymore. Overall Nadal seems a bit fitter but Djokovic moves effortless around the court. This is another tie to me! This is the area where Djokovic has improved so much and I see a clear edge for him on the tactical side. Djokovic realized that the only way to beat Nadal is to continue taking balls on the rise and really going for his shots! He now has developed the confidence to do so on a regular basis and whenever Nadal gets too defensive he does not seem to have any answers to Djokovic’s aggressive play! Djokovic Is In Control Of Most Rallies! In the 2011 US Open final Nadal also tried to hit a lot of slice backhands, which is a really bad tactic in my opinion. I think Nadal has no chance to beat Djokovic in this form once Djokovic controls the rally. The slice always puts Nadal on his backfoot and only leaves him with the hope of counter-punching his way out of trouble. Not a good strategy against Novak in 2011! One more thing to keep in mind is that Nadal is so used to running around his backhand, which opens up the court a lot. If he does this too much though, Novak really punishes him by standing close to the baseline and hitting into the open court. I think Nadal should only run around some backhands when he has a good chance to really nail the forehand! This is another area where Djokovic has improved tremendously. He used to get real upset at himself in crucial situations and didn’t play his best Tennis when it matters most. That has obviously changed in 2011 and he tends to stay quiet and focused now. Nevertheless Nadal is the best competitor I have ever seen on a tennis court and I have to give him the edge here! What Changed In The Match-Up ? 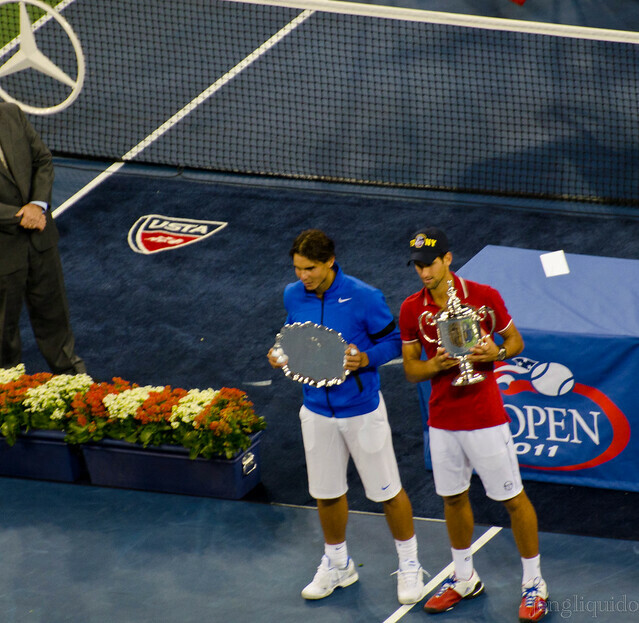 Nadal dominated the rivalry between these two great players until 2011. In 2011 though, Djokovic has been dominating and Nadal at times seemed helpless on the court against Novak. So what changed in 2011 ? I believe three changes in Djokovic’s game have made a huge impact on the rivalry. First and foremost, Djokovic is now committed to taking as many balls as possible early and ripping his backhand down the line against Nadal’s heavy forehand topspin shots! In the past other players have shown the way on how to beat Rafael Nadal. Guys like Del Potro, Tsonga and Soderling for example had some success with playing relentless aggressive Tennis against the Spaniard! Djokovic has the big advantage that he has a phenomenal two-handed backhand. He is comfortable enough to take Nadal’s heavy topspin shots that often land a bit short and absolutely nail them with his two-hander. Most players don’t have the ability or the guts to do that on a consistent basis and especially Roger Federer struggles with this situation on his one-handed backhand! The second thing that has changed is Djokovic’s physical level! Previously, you could see him breathing extremely hard after long rallies against Nadal or Federer. In 2011 that has definitely changed. The media has been talking about his new gluten-free diet. I am not sure if that made the difference or if he simply trained harder but either way this was extremely important for him. You can’t sustain that kind of aggressive Tennis when you are breathing hard after those long rallies! Lastly Novak has improved his serve tremendously. His serve is now a weapon in crucial moments where it used to be a liability in the past! What Can Nadal Do Against Djokovic ? Looking at the matches in 2011, it seems like Nadal really does not have any answers to Novak Djokovic when Djokovic is playing so well. There have been times in those matches though, where Nadal was able to compete with Djokovic’s phenomenal level. One example is the third set in the 2011 US Open final. In the first two sets Nadal hit at least 60% slice backhands and was always on defense. In the third set he started hitting through his backhand and in general was a lot more offensive. He tried to hit big forehands whenever possible and Djokovic did not back down. As a result the level of the match was ridiculous. I believe the only way for Nadal to beat Djokovic is to hit through his backhand and go for big shots off of both wings! Additionally, Rafa needs to consider running around his backhand a lot less. There are two reasons for this. 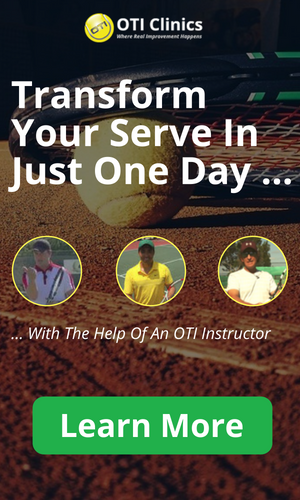 Number 1 is that he does not open up the court as much and number 2 is that he can only get more confident hitting his two-handed backhand in an agressive manner is he actually hits a lot of two-handed backhands! Check out this point where Nadal hits through his backhand and seems to have an offensive mindset right from the beginning. He needs to get back to this mindset against Djokovic! At the end of 2011 I wrote that Nadal doesn’t seem to have any answers to Djokovic. Nadal played too defensive, especially with his backhand. 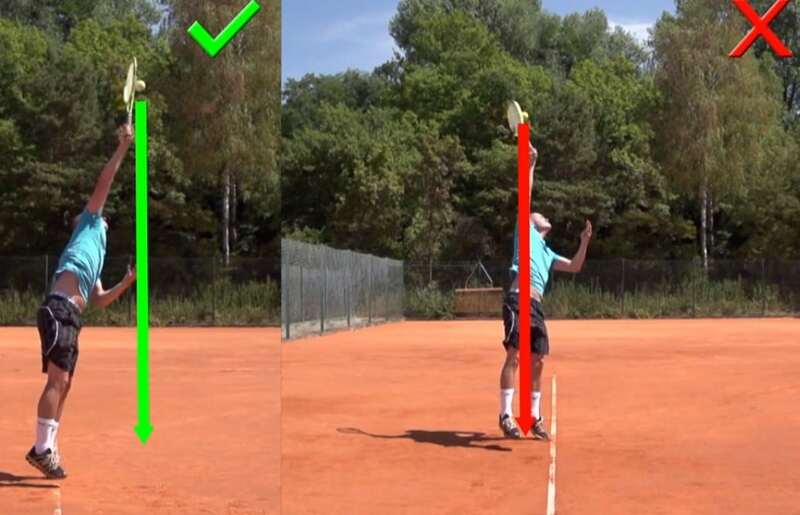 It appeared as if he did not have much confidence in the shot and therefore started slicing a lot of backhands. Their first match in 2012 was the Australian Open final, which Djokovic won in a close 5 setter. For most of this match it again appeared as if Djokovic was dominating and I still don’t really know how it ended up being so close. Nadal was slicing his backhand a lot and played most of the match from a very defensive position. The clay court season 2012 has shown a much improved Nadal though. He is now again hitting his two-handed backhand with a lot of confidence and he stopped hitting a lot of slice backhands. This is the key for him against Novak and it appears as if he realized this and went to work. I believe that the upcoming matches between these two are going to be really close and it should be really exciting! For a while it appeared as if Nadal doesn’t have any answers for Djokovic but Nadal has a history of improving the weak areas in his game and always evolving his game in general. Overall I would give Djokovic a very slight edge when he is performing at his best but Nadal is probably the mentally toughest player I have ever seen and therefore I expect the rivalry to be really close in the future! So that was it for my analysis of the Djokovic Nadal Rivalry!